Nutone VX1000 is rapidly becoming one the most popular central vacuum systems on the market. If your looking for one of the best, if not the best central vacuums out there, this is the system for you. "Top of the line", and "State the art" are among the many words used to describe the Nutone VX1000. There are many benefits and features that make this central vacuum system stand out. The Nutone VX1000 has a Sound suppression system included which makes this model a much quieter model then previous central vacuum systems that came before it. There is a status light on the hose of this system to indicate thats its bag or dust pail are full and need to be cleaned. With a front loading door, changing vacuum bags is quick and convenient. Even the system bags feature a new technology of "Easy Snap" that close the collar as your removing the bag. All Nutone VX series models including the Nutone VX1000 feature a HEPA Filtration system that includes an Anti-Microbial coating. The filtration system traps bacteria better then most other Central Vacuums on the market today. The Nutone VX1000 is setting a new trend for Central Vacuum Systems. This unit has features that sets it above all other manufactures. Even the housing of the new VX1000 unit features Corrosion Resistant, Flame Retardant, engineered and thermoplastic material. Its no wonder that the Nutone VX1000 is one the best sellers ! The strength of the motor in the Nutone VX1000 features the most horsepower in its class. With 4.8 horsepower, and 1040 air watts, this model was made for large homes. The 240 Volt rating combined with the horsepower numbers demonstrate how truly powerful this Nutone VX1000 Central Vacuum System is. The Nutone VX1000 is a true "Builders Favorite". This unit features a new oval design that is setting a trend. This design sets the Nutone VX1000 and the entire VX series line apart. Smaller Corners and spaces are now available to be used by the Nutone VX1000 central vacuum system. The convenient, wall hugging design of the Nutone VX1000 is suitable for any suitably sized space in your garage. The convenient installation with optional venting options allow for easy placement in even the tightest corners. This system represents the future of Central Vacuum Styling and Design. Please view it on our web site and examine all of the benefits available to you today. Product page on our web site. Everyone should enjoy the pleasure and convenience of a Doc It Retractable Hose system. The number one complaint about central vacuum systems is having to carry around a bulky hose. The Canavac Doc It Central Vacuum Retractable Hose system comes with a kinkproof hose that is extremely durable. Canavac Doc It also features an accessory kit and a finishing kit. The Doc It system offers superior cleaning and is exceptionally quiet. Each purchase includes everything you will need to install and enjoy your Doc-IT Central Vacuum Retractable Hose System. Doc IT Retractable Hose Management Systems allow you to harness the power of your central vacuum. This Automatic Hose offers easy fingertip controls on the handle giving you the ability to release and to retract the hose, and turn your central vacuum system on from the comfort grip handle. With the premium light weight kink proof hose you also eliminate the age old complaint when it comes to central vacuums ….dragging and lugging bulky central vacuum hoses throughout the home. What are you waiting for get your Doc It Central Vacuum Retractable Hose System Today! The Doc it Central Vacuum Retractable Hose system comes in 3 packages, 45ft basic, 55ft premium, and 55ft Premium Plus. These Retractable hose systems clean from 2,000 square ft up to 3,000 square ft. All 3 packages offer a 12' Floor Tool, Easy storage tool caddy, Dusting brush, Crevice Tool, and 2x Height adjustable chrome wands. The Basic system has an electronic handle, and Deluxe LS Powerhead. The Premium system upgrades to a Premium Electric handle. The Premium Plus further upgrades to a High Performance European XLS Powerhead. As an additional gift to you, ThinkVacuums.com, offers a deluxe Wood/Bare Floor Dust Mop Tool with all 3 packages. Just like magic, the hose is dispensed and then disappears inside a small door installed into the wall. Additional electric brush and floor tools, and other accessories are included with each Cana-Vac Doc IT purchase. Multiple Doc It stations can be positioned throughout the home depending on size and floor plan. The Cana-Vac Doc-IT is by far the easiest solution to central vacuum hose management Doc-IT is an easy installation in new construction, but it is also possible to retrofit a Doc-It in your existing home. Cana-Vac’s Doc IT Central Vacuum Retractable Hose Management Systems are compatible with all central vacuum system on the market today. 1. Does this Central Vacuum Retractable Hose system retract with Suction or electronically ? The Doc It retractable hose system features a fully electric push button management system that guarantees smooth, and constant in and out motion. With other systems that use suction, there is a problem with the hose getting stuck during retraction. As those systems get older, they tend to slow down. These systems also can cause stress on the turbulence that occurs in the piping. 2. Does the Doc It Hose ever clog from use. Any central vacuum hose can clog, but the Doc IT Central Vacuum Retractable Hose Management System is virtually impossible to clog due to its 1.44 inch interior diameter. Doc it features the largest diameter hose on the market which prevents it from clogging. If the hose should ever clog, the large interior diameter makes it very easy to "snake" out. 3. Which Floor Tools and Carpet Nozzles can be used with the hose ? Any type of floor tool or carpet nozzle may be used with the Doc It retractable hose system. However, we recommend against using air driven nozzles, as they will not perform optimally with this type of system. An Air Driven nozzle performs poorly due to the long hose length and long amount of air travel. for Bare Floors, ANY tool designed for them will work well with the Doc It system. This new innovation is a very worthwhile investment and addition to your central vacuum system. We highly recommend it for all of its features and design. Central Vacuum Retractable Hose on our web site. There are many Reasons for buying a NuTone central vacuum system. NuTone central vacuum systems are one of the most popular brand of vacuum cleaners in the world. They have a reputation for providing high quality products. There are many reasons why NuTone Vacuum Systems are so popular. Here are our top reasons for recommending them to you. Motor: The motor used in all NuTone central vacuums have been designed for deep cleaning and hence are considered to be much better than the standard or conventional vacuums. Filtration: NuTone central vacuum cleaners come with better filtration technology. This means that while cleaning the home, blown dust won’t spread around. When you use a NuTone Central Vacuum systems, your home will become cleaner and the quality of indoor air will improve. All dust particles will be exhausted right to the exterior of your home unlike in standard vacuum cleaners where the fine particles of dust are scattered outside. Some of the NuTone vacuum systems also use HEPA filtration. HEPA stands for high efficiency particulate air. HEPA filters can remove 99.97% of airborne particles that are 0.3 micrometers in diameter. Due to the use of HEPA filtration technology, NuTone vacuum cleaners are able to offer a higher degree of cleaner air in the home. 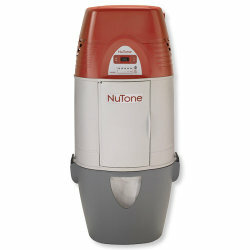 Nutone is one of the Top Rated Central Vacuum brands available. NuTone is recognized as the Number 1 brand as well as the "Brand Used the Most" for Central Vacuums systems. NuTone is currently regarded as “The Leader in Central Vacuums" according to a 2009 brand use study conducted by the Builder Magazine. As of today, the NuTone vacuums are considered as America’s “most wanted” built-in appliance. Powerful suction: NuTone central vacuums have a maximum amount of suction power. This central vacuum comes with a powerful cleaning suction that ensures that your home is rid of all the dirt including fine particles normally suspended in the air. Long lasting: NuTone central vacuum systems are better then conventional or standard vacuum cleaners. These systems have been created to last longer, and are convenient to use. Nutone adds more value to your home cleaning. Accurate bag-full lights: The NuTone vacuum cleaners are available with progressive indicator lights, which will indicate the time to change the bag. Some of the other salient features include a true "bag-full" light and this means that the central vacuum system can also automatically shut down when the bag is full and thus avoid rupturing the bag. All NuTone vacuum cleaners come with a simplified filter changing and bag removal process. All you have to do is open the front-facing door panel and take out the full bag. They offer a complete document for installation and how to work with their vacuum cleaners. The installation document also provides guidelines to operation of the cleaner and how to remove bags. Convenient installation: All NuTone central vacuum cleaners are convenient to install. The slim profile of the vacuum cleaner helps it to fit into tight corners as well. One year Warranty: NuTone offers a 4-8 Year Limited Warranty on all their products including central vacuums. Their warranty service states that: To qualify for warranty service, you must (a) notify NuTone at the address or telephone number stated below, (b) give the model number and part identification and (c) describe the nature of any defect in the product or part. At the time of requesting warranty service, you must present evidence of the original purchase date. NuTone vacuum cleaner are one of the best in the world and are definitely much above the standard cleaners when it comes to quality and power. German-engineered and constructed to the highest standards. Active Height Control, a Timing Belt-driven Brush Roller, and an Intelligent Filter Configuration allow the Automatic X4 to clean effectively while using less energy. From Hard Floor to Carpet the electronic controls identify the floor and the height of the carpet nap. The brush will be raised or lowered automatically. This guarantees optimal cleaning performance on all types of carpet and flooring and protects the floor from damage. And on hard floors, the SEBO Automatic X4, with its intelligent design, cleans incredibly well. The sealing strip on the bottom of the machine stops the kickback of dirt and channels the airflow through the remaining three sides, increasing the cleaning performance. The SEBO Automatic X4 delivers S-Class filtration as a standard feature and is well suited for sufferers of allergies or asthma. First, the three-layer filter bag collects the vast majority of the debris. Then, the remainder of the particles are collected by the micro-hygiene filter. Only the smallest, most harmless of particles remain. And to ensure you the cleanest air possible, there is also an exhaust filter. With a clearance of only 5 ½ inches, here is finally an upright that will go under your bed! Extra long 40-foot cord for a large cleaning radius. Turbine Upholstery Nozzle & 9' Extension Hose Included. When it comes to upright vacuums, the intelligent choice is SEBO Automatic X. The Sanitaire SC899 is one of the leading commercial vacuum uprights available today. This unit is considered to be the flagship of the Sanitaire upright line. It comes with a 2 year limited warranty. Sanitaire SC899F is considered an industry standard for use in multiple settings. Vacuum restaurants, car dealerships, hotels, hospitals, clubhouses, marina's, warehouses, schools, retail stores, or theaters. Vibra-Groomer I, Chrome Steel Ball Bearing Brush Roller, with Replaceable Bristle Strips. This outstanding Sanitaire Commercial Vacuum Upright is available on our web site, Sanitaire SC899F along with the entire Sanitaire line of vacuums. Come review our Award Winning selection of vacuums today. CENTRAL VACUUM SYSTEMS offer a substantial advantage over normal upright vacuums. BUYING A CENTRAL VACUUM. Why buy a Central Vacuum ? Studies have shown that indoor air pollution is more detrimental to you and your family’s health inside your home than outdoor pollution. Vacuum cleaning has become an essential part of day-to-day existence. Global weather is changing and pollution is at its peak; all this is bringing more dust and dirt into homes. Of course then there are children and pets that bring in more than just dirt. Somewhere down the line, the requirement for vacuum cleaners has become essential. Finding the right central vacuum cleaner can be a difficult task, hence central vacuum cleaning is the best option because it’s reliable and functionally effective. What is a Central Vacuum System ? A central vacuum system is a complete cleaning system that is built within the home with the main unit located typically in your garage, basement, or utility room and PVC pipe running through the walls via the attic or crawl spaces. You will find most of the modern homes or newly built homes having a central vacuum system. Some homes come equipped with the tubing for the vacuum system, or roughed in, and the owners only have to invest in buying the tank as well as the hoses. You are probably saying to yourself, “my house doesn’t have one, now what?” There is nothing to worry about because it is fairly easy to install a central vacuum unit within your home. All you have to do is plug in the hose and the dirt is but a memory. Reduced Noise Pollution : Unlike in traditional or standard vacuum cleaners, the central vacuum does not have any loud and deafening noise. One of the major benefits of installing a central vacuum system is that it will always be situated away from your living area. This is why the relatively low noise of the motor gets masked by natural sounds. Versatility : One of the biggest advantages of using a central vacuum is that it is a versatile machine and easy to use. It is a versatile machine and definitely far better than the standard vacuum cleaners because it will help you to clean every nook and corner of your home, kitchen, and garage. Deep Cleaning : A central vacuum unit is built for power cleaning. These machines have powerful motors that are at least 10-times stronger than your traditional portable vacuum cleaners or hand-held vacuums. It will also tackle the high to reach places like track lighting and on the fan blades, where a lot of dust accumulates. HEPA Air Filtration : Most better central vacuums provide HEPA air filtration. HEPA stands for high efficiency particulate air and it is a standard that has been created by the US Atomic Energy commission. Higher Home Value : One of the important things to note is that a home with an installed central vacuum system will always have a higher market value where real estate is concerned. Apart from this, central vacuums have long-life, are durable, require one-time investment, and low maintenance. At www.ThinkVacuums.Com, we offer all of the industry leading Central Vacuum Systems, such as, Drainvac, Canavac, Purvac, Hoover, Duovac, Powerstar, and Nutone. Please view our individual sections on our web site to learn more about the best Central Vacuum System for you. I am extremely pleased to recognize you as THE NUMBER ONE SEBO DEALER in the USA for the year 2010 ! And on behalf of all the employees of SEBO America, thank you very much for your dedication, loyalty and support to a truly unique vacuum brand. It is only through the hard work of fine business people, like you, that SEBO can grow and further develop in the marketplace of the future. So, again, thank you for this effort. To commemorate your status as a member of an elite group of SEBO dealers, please accept the enclosed TOP 10 plaque. I know that generating excellent SEBO sales volume, particularly in such a difficult economic climate, is quite an achievement. You should be proud of your salesmanship and dedicated service to your customers. In closing, please know that SEBO will work hard to be supportive of your sales efforts in this New Year and beyond. 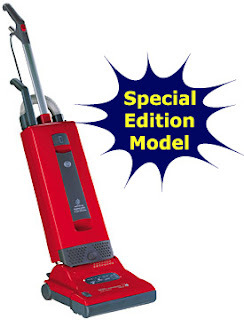 Purchase a High Quality SEBO Vacuum from ThinkVacuums.Com today ! You can make your home environment healthier with the latest technology available in Central Vacuum Systems. By having a Central Vacuum System installed in your house, all of the dirt and allergens can be sucked away through a series of wall inlets that are installed throughout your home. The inlets(wall inlets) are distributed through the house and are connected to a state of the art Central Vacuum Unit. These inlets are used to attach vacuum hoses and accessories allowing the user to have a lightweight, yet extremely powerful vacuum for the entire home. Typically, Central Vacuum Units are installed in the basement or garage for ease of accessibility, and to keep the waste materials away from the home environment. Top Benefits in owning a Central Vacuum System. 1. Exhaust venting outside of the home environment. Dust particles that go through normal vacuums are re-introduced back into the living areas of the house. 2. Central Vacuums have Five Times the suction of a normal vacuum. More dirt and debris are sucked up with greater efficiency and power, thus making for a cleaner home. 3. The vacuum heads and accessories are lighter then standard vacuums and allow for an ease of use not available with a standard vacuum. 4. Filters on Central Vacuum systems allow for a much larger holding area of dirt and debris, so changing them can be done on a less frequent basis. 5. Vacpan dustpans make sweeping much easier and allow for the swept debris to be sucked out through a vent that is incorporated through the wall to the Central Vacuum system. Reduce the allergens, dust, and dirt in your home with greater efficiency and convenience by installing a Central Vacuum system from ThinkVacuums.Com today !